Adorable classics! Make them in fun brights or traditional neutrals. Every prince or princess can have these charming, easy and quick-to-crochet basics, from booties to hoodies. 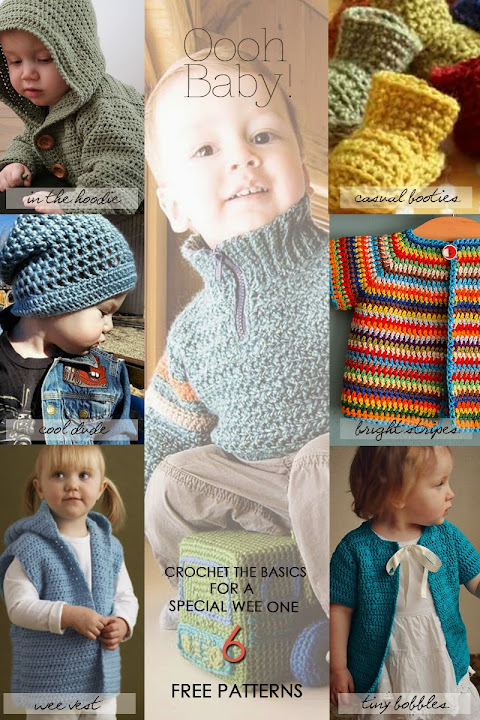 Ideal patterns for the mom who is learning to crochet or for more experienced knitters that love to crochet "wee" fashions. 1. In the Hoodie simple, no-fuss buttoned jacket with hood . 2. Cool Dude slouch hat for stylish babes. 3. Wee Vest sleeveless hoodie, ideal for cool spring days. 5. Casual Booties quick to crochet in many colours. 6. Bright Stripes easy cardi to make in colourful stripes or classic solid. 7. Tiny Bobbles a cardi too cute and hard to resist.